Kenneth is the managing partner and clinical director of Bay State Physical Therapy Boston (Whittier Street Health Center & Huntington Ave YMCA) and Roxbury (Dimock Health Center). Prior to opening the Roxbury location in 2015, Kenneth was the clinical manager for the Roxbury Crossing location. He attended Sacred Heart University where he earned his Doctorate in Physical Therapy. Since graduating, he has clinical experience in various physical therapy settings such as outpatient, home care therapy and skilled nursing therapy. Kenneth is an active participant of continuing education courses offered by American Physical Therapy Association (APTA), Northeastern University in partnership with Bay State and Massachusetts General Hospital. Additionally, he is an APTA credentialed clinical instructor to provide support and exposure to physical therapy students. As a Roxbury native, Kenneth is committed in improving the health and well-being of all individuals in the community. He frequently develops and participates in community programs, including partnering with other local organizations to educate and promote health and wellness. As a therapist, Kenneth performs a comprehensive evaluation; along with physical findings, he identifies barriers and factors in patient lifestyle and habits before prescribing a plan of care. 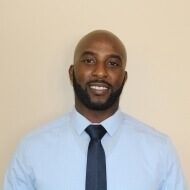 Kenneth promotes patient education and accountability to successfully achieve desired goals as a team. He utilizes extensive manual therapy, neuro-muscular re-education, functional training and strengthening to rehabilitate individuals to their maximal level of functional and recreational activities. Kenneth incorporates his football and track background along with evidence based practice to treat all of the conditions listed below. During his free time he enjoys spending time with his family and volunteering in the community. He LOVES watching Boston sports.